As machines have grown in sophistication, and as artificial intelligence has come to occupy the imaginations of increasing numbers of computer scientists, the idea that the functions of the human mind might be stimulated by computer algorithms has gained more and more momentum. In 2013, the EU invested over a billion euros of public funding in a venture called the Human Brain Project. The project, based in Switzerland and directed by the neuroscientist Henry Markram was set up to create a working model of a human brain and, within ten years, to simulate it on a supercomputer using artificial neural networks. 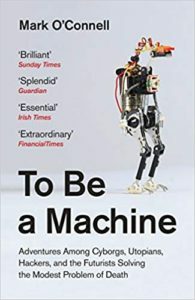 Wellcome Book Prize 2018 winner Mark O’Connell’s To Be a Machine: Adventures Among Cyborgs, Utopians, Hackers, and the Futurists Solving the Modest Problem of Death is an incredible account of the journalist’s investigation into what is transhumanism and who are these people actively engaged in this movement, in their search for the Holy Grail of longevity with the help of technology. It is an astonishing book for the amount of research involved, the innumerable meetings, the conferences attended, ideas shared, all of which are pretty amazing given that money is being poured into researching this niche area of how the human life span can be increased. It it is the underlying, very human, deep fear of death that is propelling this research forward with entrepreneurs like Peter Thiel also involved in funding these activities. There are famous centres like the centre maintained by the Alcor Life Extension Foundation which is experimenting with cryogenics in keeping humans “alive”. In another interview with The Verge he says “When you talk to transhumanists, in one way or another, they all aspire to knowing everything and to being gods basically. And I just sort of thought, this is actually something I can’t relate to at all. The idea of being that all-powerful and omnipresent, it’s almost indistinguishable from not existing and I can’t quite justify that. It is a surreal world that the transhumanists believe in, with almost an evangelical fervour for defeating mortality. The reason Mark O’Connell embarked upon this quest of his was because he had become a father for the first time and suddenly questions of mortality and death became very real. ( On a related note. Here is a superb article in The Paris Review of Mothers as Makers of Death by Claudia Dey, 14 August 2018.) But he is very clear, even after one a half years of research for this book, that he will never be a cyborg or a transhumanist. A fact he reiterates in the book as well as in an interview to The Millions. His deep dive in to the subject makes him an expert in the field so he recommended five books to understand transhumanism for The Guardian too (10 May 2018). Whether you agree or not with the transhumanists, To Be a Machine must be read to understand how man is pushing the known boundaries of knowledge using technology to try and find an answer to the eternal question “How to overcome mortality?”. It is like reading science fiction except that all that is written in the book is very real — very real people, very real experiments in very real facilities. For now it may seem like a fanciful playground of a bunch of well-funded individuals ( mostly male) who may or may not find their Holy Grail, but a possible offshoot of this innovative research may have other more practical applications. Who knows?! Only time will tell.